Japan is an archipelago made up of 6,852 islands located in East Asia. It shares maritime borders with China, North Korea, South Korea, the Philippines, Taiwan and Russia. The “land of the Rising Sun” is one of the most developed countries in the world and it has the world’s 3rd largest economy. Japan is a fairly temperate country with average winder temperatures of around 5 degrees Celsius and average summer temperature of around 25 degrees Celsius. The rainy season generally lasts around 6 weeks and heavy rain storms are commonplace. Japan has given up its right to declare war and although it does have an army, this is only used for self-defence and peace-keeping. The country has one of the highest life expectancies and one of the lowest child mortality rates out of any country worldwide. Read more about Japan from Wikipedia. This is the country to go if you want to experience a unique Asian culture. It has everything from skiing in the mountains, temples, semi-tropical islands and technology that you won’t see anywhere else on earth! English teachers are also in high demand and teachers are highly respected in the country. You will find eager students, good working conditions and you will also be able to save some money. There are a range of teaching jobs available and although you will need a bachelor’s degree, you won’t necessarily need a teaching certificate. There are jobs across the four main islands of Hokkaido, Honshu, Kyushu and Shikoku. You will find opportunities both in the big cities and smaller towns. Most teaching jobs can be found in the three largest cities of Tokyo, Osaka and Nagoya. 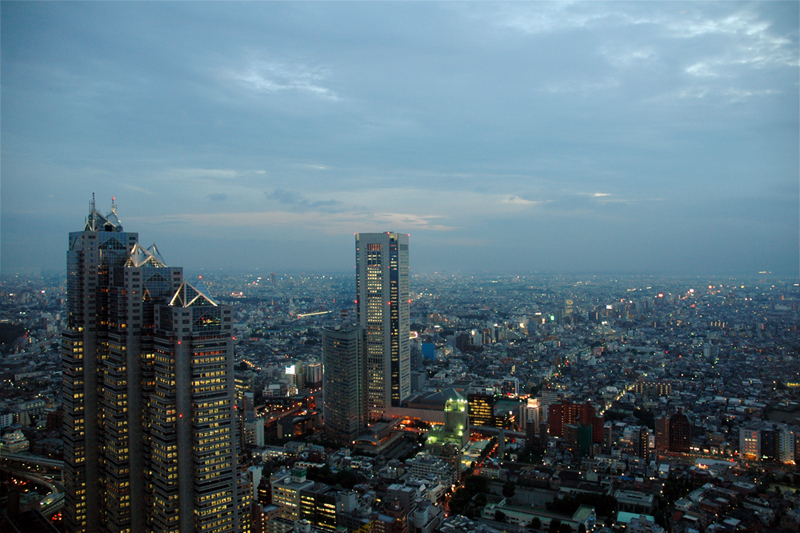 “Skyscrapers of Shinjuku 2009 January” by Morio – Own work. Licenced under CC BY-SA 3.0 via Wikimedia Commons. The Japanese Exchange and Teaching (JET) Programme is a government ran programme. It was established in the late 1980s and currently hires more than 2,000 native English speakers to teach in Japanese schools. There are many benefits of working for this programme including a good salary, visas, flights, accommodation and health insurance. You do need to be less than 40 years old to apply. You could find yourself working anywhere in Japan and not just in the larger cities. Conversation schools are known locally as eikaiwa and these private schools can be found all over the country. They are constantly looking for staff and different schools have a range of salaries and benefits on offer for their teachers. You will normally be working in the larger cities and you will often be working long hours including evenings and weekends. English is part of Japan’s school curriculum and many schools will employ assistant language teachers. You will find that most people apply through the JET programme above, but there some can also be hired through the prefectural board of education or a private contracting agency. Most of these jobs will provide housing, national holidays plus another 10 to 20 days off per year, and reasonably good salaries. However, you will usually have a large classroom with around 40 students per class. University jobs are usually well sought after and have a low turnover rate of teachers. The reason is that you will only be teaching for around 10 hours per week (and do some basic administrative work), the salary is good, you are often provided with accommodation and you get 3 months holiday per year. Many TEFL teachers take private lessons and you will often find them taking one-on-one lessons and it can be a good way to supplement your income. Some teachers can also turn this into a full time job, but you should always check that freelancing is compatible with your visa. Moreover, this type of job can be difficult unless you have a lot of students. You may find that students cancel at short notice, meaning that you need to change your schedule frequently. You will almost certainly need a bachelor’s degree to teach in Japan as this is required by law to secure a work visa. If you don’t have a bachelor’s degree you might qualify for a working holiday visa. However, you don’t necessarily need to have a teaching certificate such as TEFL, TESOL or CELTA. For a number of schools the only requirement is that you have a bachelor’s degree and that you speak English as your first language. If you fulfil both of these requirements, you should have few problems finding a job. If you want to get a higher paying job with more benefits, you will find that having qualifications and experience will help. [sociallocker id=”2079″]You certainly won’t get rich working as a teacher in Japan, but you should be able to earn enough money to pay for your living costs plus a little more. Salaries can range anywhere from $2000 (USD) per month up to $3500 (USD) per month. It depends on where you are working and your qualifications and experience. The average cost of living in the country is around $1500 (USD) per month. So if you don’t have an expensive lifestyle that involves eating out or buying all the latest technology, then you should be able to save a little each month. Read more about the cost of living in Japan from Numbeo. There are many types of visas available for English teachers and it is becoming quite common to enter the country on a tourist visa, find a job and then change to the appropriate visa. However, it can take 45 days to get a work visa, so if your tourist visa expires before this happens, you will need to leave the country and re-enter. There are many types of work visa and most teachers will have an instructor visa. These visas are usually given for 3 years, but you will need a bachelor’s degree to get one. If you don’t have a bachelor’s degree, you might qualify for a working holiday visa. There are actually 27 different types of visas for Japan, so it can be a complicated process. However, most schools will help you to arrange the correct visa whether you are offered a job before your arrive or you find one after you have arrived in the country. Read more about working visas in Japan here. There are two ways that people find teaching jobs in Japan, either before your go or after you have arrived in the country. If you want to find a job before you go, you can search online. Many jobs are advertised on ESL jobs boards and through recruitment agencies. The best time to start looking for work is before February and March, but it is possible to find job throughout the year. After you have been accepted for a teaching position, you’ll need to start arranging your visa, but your new employer should help you with this. The second option is to go Japan and start looking for work. This can be more costly because you will need to support yourself before you successfully find a job. You can contact schools directly either by email, telephone or in-person. There are thousands of native English speaking TEFL teachers in Japan and it’s easy to see why people want to go and teach there so much. You will find that there are many jobs on offer and for most jobs the only requirement is that you have a bachelor’s degree and that you are a native English speaker. You will also earn enough salary to cover your basic living costs and with most jobs, if you live frugally, you should be able to save a few dollars too. Although I have never worked in this country, every effort has been made to ensure that this information is correct. This blog post has been written after extensive research online, interviews with teachers who have worked or are working in the country, and local schools have been contacted. If you have any questions, please leave a comment below. If you have worked or are working in Japan, we would love to hear from you, so please leave a comment and share your experiences with us.